"Fresh garden flavors mingle with cheeses. Delicious year round - but especially when seasonal veggies are available." 1. Preheat oven to 375°. In a large stock pot cook the lasagna noodles according to package directions until just tender, about 10 minutes. Drain the noodles; rinse with cold water thoroughly, drain well; set aside. 2. In a medium bowl, stir together egg, ricotta cheese, 1 cup of the shredded Italian or Mozzerella cheese, salt, and pepper; set aside. 3. To assemble lasagna: Lightly grease a 13 X 9 X 2 inch baking pan. Arrange 4 of the cooked noodles in the bottom of the pan, trimming and overlapping as necessary to cover the bottom with 1 layer of noodles. Top with spinach or kale. Spoon half of the ricotta cheese mixture over the spinach or kale layer, spreading evenly. 4. Spoon one-third of the pesto over the ricotta layer, spreading evenly. Top with another layer of noodles, trimming to fit. Top with mushrooms. Spread remaining ricotta cheese mxture over the mushrooms. Spread half of the remaining pesto over the ricotta layer. Top with another layer of noodles and the remaining pesto. 5. Drain canned tomatoes, and slice, quarter, or halve tomatoes and place on top of the layers. Cover the pan with foil. Bake covered for 45 minutes. Uncover, and sprinkle with remaining Italian blend cheese. Bake, uncovered for 15 minutes more or until the cheese is melted and the lasagna is bubbly. Garnish with chopped, fresh parsley. Allow to sit for 10 minutes before slicing. This recipe can be prepared ahead for the freezer but DO NOT add the tomatoes and do not bake ahead. Cover with plastic wrap, and then aluminum foil. Package the remaining 1 cup cheese in a resealable plastic bag. This casserole may be refrigerated up to 24 hours or frozen for about 3-6 months. Reheating Instructions: Thaw lasagne, if frozen, in the refrigerator for 48 hours before baking. Place thawed or refrigerated lasagna on a oil lined baking sheet. 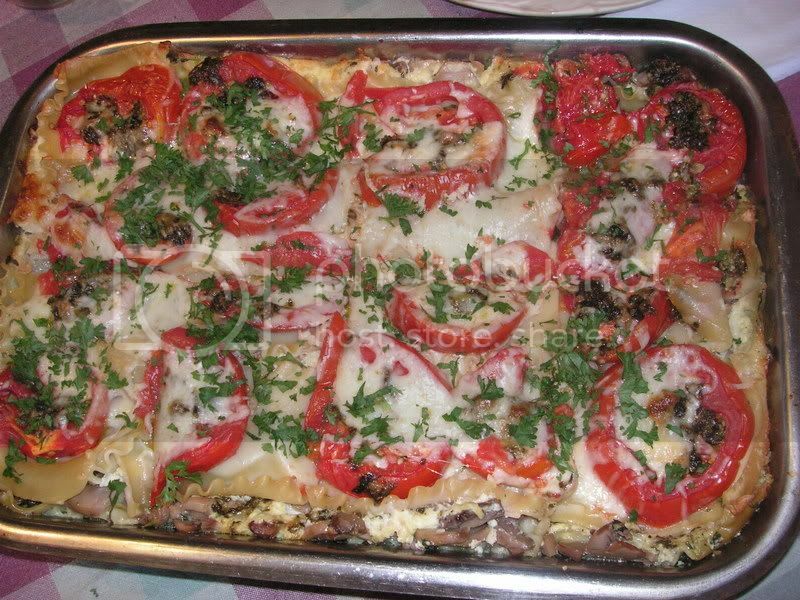 Remove plastic wrap; top lasanga with tomatoes. Bake lasagna in a preheated 375° oven, covered with foil for 40 minutes; uncover and sprinkle with remiaing cheese. Bake uncovered 10 minutes more or until heated through,bubbly and cheese is melted. Re-cover and let the lasagna stand for 1-20 minutes before serving. Makes 8-10 servings. Chop basil, garlic and pine nuts in food processor bowl until finely chopped. Add cheese, salt, and gradually drizzle in olive oil until you have a smooth paste. Use right away, or freeze for future use.